The Trials Of Cato, a band that arrived fully formed and functioning from Beirut in the winter of 2016, have since torn a shape very much their own into the canvas of the UK folk scene. Originally from North Wales and Yorkshire, whilst living in Lebanon they spent a year boiling down the roots of their sound into a sweet hybrid of traditional influences that intrigued Lebanese audiences in the country’s biggest venues. They moved back to the UK to quickly produce their self-title debut EP at the Abbey Road Institute in London. The recording was well received – BBC Radio 2’s Mark Radcliffe hails them as “one of the real discoveries on the folk circuit in recent times.” Their musical development in the run up to their debut album proper, has been swift and sure. This winter the trio release Hide And Hair, after a year of near-vertical ascent from a standing start. The trio may inhabit the folk genre with a grateful respect for its history but with this album they twist its old bones into something febrile and contemporary. Stunning instrumental technique hooked to an innovative presentation of traditional and original material leads to a sound where a seventeenth century widow’s lament for a lost soldier lover (My Love’s In Germany) can segue into a stomping dance tune – transporting us from the gloom of the Thirty Years War to the vibrant bounce of beckoning festival main stages. With a clear nod to the musical revivals of the sixties and seventies, Hide And Hair is rooted in the folk traditions of Ireland and Britain but the themes remain decidedly contemporary and questioning. Recorded in the spring of 2018 at Penylan studios in mid-Wales, the array of material is hugely diverse, the album almost being treated as a journey across both time and continents. Album opener Difyrrwch is their own arrangement of three traditional melodies, two Welsh, one English (Hen Ferchetan, Difyrrwch Gwyr y Gogledd, The Parson’s Farewell) and Kadisha – the title of which was taken from the name of a spectacular valley in northern Lebanon – finds the band inspired by their first steps into a part of Lebanon peppered with monasteries and ancient buildings. Hide And Hair is as much about characters as it is places, however. Gloria is a story of self-discovery and a celebration of being true to oneself. And Gawain takes its inspiration from the medieval tale of Sir Gawain and the Green Knight. It’s a folk song in spirit but perhaps one which here draws on some heavier rock, psychedelic and Eastern influences, with the electric guitar even making a rare appearance. Like Gloria, it is essentially the human story of an ordinary character trying to deal with extraordinary circumstances – in this case a beheading match with the supernatural character of the green knight. Throughout Hide And Hair, the band’s skill, playfulness and willingness to keep exploring and developing their sound – and the genre – is clear. 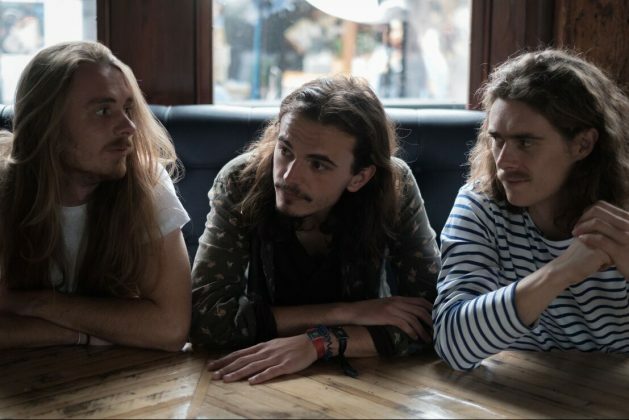 Whether plying their trade busking, performing in front of thousands at festivals across Europe, or frequently selling out their own club shows, The Trials of Cato have the wind behind them. Mixed by Donald Richard in Toronto and mastered by John Davis of Metropolis Studios in London.